You’ve seen many beautiful sunset photos in Sky Lights. 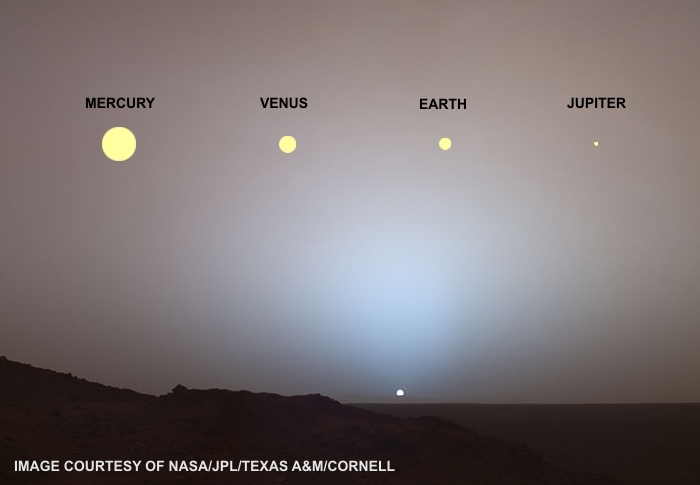 Have you ever wondered what sunsets look like on other planets? Here’s one NASA actually photographed. This spectacular sunset image was captured by the Spirit Rover on the surface of Mars, May 19, 2005. It shows the Sun setting behind the rim of Gusev Crater, some 80 km (50 miles) distant. The colors of a sunset depend on what mix of gases compose the planet’s atmosphere. And some planets don’t have atmospheres — sunsets in those places are like flipping a light switch from on to off. There is no twilight. The apparent size of the Sun decreases as you move farther out into space. Inset images show the Sun’s apparent size as seen from Mercury, Venus, Earth, and Jupiter, to the same scale as the NASA image. I stopped at Jupiter, since the Sun’s apparent size gets too small when you move much farther out. By the time you get to Pluto, the Sun just looks like a bright star. Sure, it would still be the brightest star in the sky, but you wouldn’t discern any apparent size with the unaided eye — it would appear as a point source. On Mercury, which has no atmosphere, the Sun would appear its true whitish-yellow color. When the Sun sets, the sky goes from daylight to total blackness with no twilight at all, much the same as watching a sunset from Earth’s Moon. On Venus, you wouldn’t see much of any sunset. Because of its thick layer of clouds (which never part) even bright daylight is equivalent to an overcast day on Earth. The color of the sky would be a hazy yellow. It’s atmosphere is mainly carbon dioxide, sulfur dioxide, and nitrogen, but it’s so thick you can never really “see” the Sun. At sunset you’d notice it was getting darker, but you’d be hard-pressed to locate where on the horizon the Sun was actually setting. Only a few images have been captured from the surface of Venus. They were obtained by the Russian Venera 9 and 10 landers back in 1975. You can see some of those images here. Mars is a special case, since it’s the most Earth-like planet in our solar system. With its very thin atmosphere consisting mainly of carbon dioxide (and wind-blown dust), you’d see a salmon-colored sky with some pastel blues around the Sun. The above image shows these colors accurately. You’d get some twilight on Mars, but it wouldn’t last as long as on Earth. Since the Sun appears only 2/3 the size we Earthlings see, it disappears more quickly. A mere 5 minutes elapse between the time when the setting Sun first touches the horizon, and the time it’s completely set. We get 7 minutes here on Earth (average times). No point talking about sunsets on Jupiter or, for that matter, the other gas giants. They have no solid surface for an astronaut or robotic rover to land on. Saturn’s largest moon Titan, the only moon in the solar system with a substantial atmosphere, presents some interesting possibilities. Check out this image from the surface of Titan photographed by the Huygens Probe. Titan’s atmosphere is 98% nitrogen + 1.5% methane. That mix produces a deep salmon-orange color, with pastel blue-greens appearing near sunrise and sunset. And so, fellow Earthlings, feel privileged to enjoy our beautiful sunsets. We know there are Earth-like planets orbiting other stars from recent discoveries by the Kepler Space Telescope. And their sunsets could be even more beautiful than ours. Unfortunately, we won’t be sending astronauts or robotic rovers to those planets anytime in the near future.